There have been many books written about Benghazi, but not every book led to a personal attack from the White House. And yet that's what happened with "Architects of Disaster", the book by former House Intelligence Committee Chairman Pete Hoekstra indicting Obama and Hillary for the Libyan disaster. In "Architects of Disaster", Hoekstra lays out the case against the intervention in Libya, a war that still remains nameless and hardly discussed despite the post-war murders of five Americans in that country. Beginning with the attack on the American compound in Benghazi, he traces back the roots of that disaster to Obama and Hillary's intervention in Libya which ended up empowering Islamic terrorists. As Hoekstra states, the cause of that atrocity was rooted in the administration's belief that "Jihadists can be both trusted and managed." And as Hoekstra, currently a Shillman Senior Fellow with the Investigative Project on Terrorism, points out that, "in spite of all that has happened... the Obama administration has continued this policy to the present day." And appears ready to continue it forever. Despite that beginning, "Architects of Disaster" is less of a look at Benghazi and instead represents a wider examination of what really happened in Libya. Benghazi was one of the symptoms that Obama and Hillary's war had gone badly wrong. But it was neither the beginning nor the end of what was taking place in Libya. It was a bloody moment that made Americans rethink a war that they had opposed, but had otherwise never really paid much attention to. The Libyan War was swiftly swept under the rug after the Benghazi attack made it clear that it could not and would not serve as a useful platform for Obama and Hillary's election campaigns. The United States still carries out the occasional drone strike against Jihadist leaders in Libya with little fanfare. The failed war still lingers, but in contrast to Iraq, this Obama and Hillary disaster has been buried out of sight. But it is the aftermath of this war in a country where Al Qaeda, Muslim Brotherhood and ISIS affiliates dominate entire cities, that "Architects of Disaster" documents. And Hoekstra approaches the subject based on over a decade of experience, including personal meetings with Gaddafi and close involvement in the Congressional approach toward Libya. 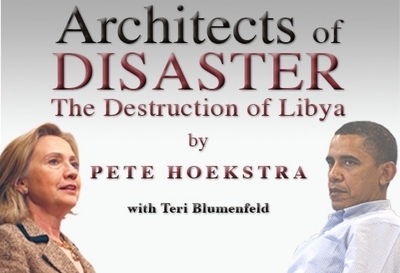 Hoekstra has few illusions about the Libyan dictator, but he graphically lays out the costs of Obama's alliance with Islamic terrorists to Libya and to the United States. He explores links with the LIFG, whose Muslim Brotherhood conversion from Al Qaeda loyalists to "moderates" held for about as long as the weather. The ultimate cost of the championing of "moderate" Islamist terrorists by Obama and Hillary came with groups that even the notoriously terrorist-friendly administration considers beyond the pale, such as ISIS, gaining a foothold in a nation dangerously close to Europe. The underlying question of "Architects of Disaster" is the old one about the merits of intervention, whether the United States should pursue pragmatic policies based on our national interests or whether we should advance international democracy as a national interest. Obama had repeatedly disavowed values-based military intervention, both before and after his Libyan War, and yet his military intervention in Libya set out the imposition of "our values", or at least his version of them, as a national interest. But Obama's version of nation building had little to do with the open democratic standards of past administrations. While his team still talked and still talks about democracy, it was Islamism they were after. Hillary Clinton's recent defense of her Libyan War rested on the fraudulent "democratic" Libyan election. And yet the administration's pattern was not one of open democracy, but of preferential nation building for Islamists. It is this hybrid of Islamist nation building whose contradictions and conflicts the Libyan War exposed and which "Architects of Disaster" delves into. By fusing international democracy with Islamist outreach, Obama and Hillary had created a policy that was the worst of both worlds, which aided terrorists, alienated allies and spread Islamic terrorism around the region and around the world. Hoekstra argues that Gaddafi became a useful instrument against Islamic terrorism once an agreement was reached. Certainly there is no doubt that regime change in Libya vastly increased terrorism rather than reducing it. Libya now hosts terror training camps for some of the worst terrorist groups in the world and Libyan weapons have shown up in the arsenals of global terror groups far from that country. That is what makes "Architects of Disaster" valuable as a review of the bad decisions that led to the disaster in Libya and the scope of the aftermath of that disaster. Libya was where Obama and Hillary's views on the Middle East, on Islamist involvement in politics and on military intervention were tested to disaster eventually costing the lives of five Americans, four of them in Benghazi. Obama, as Hoekstra points out, broke Libya. But Libya also broke Obama's foreign policy. Libya is one reason why his approach to Syria has been so hesitant and muddled. The aftermath of regime change in Libya, not to mention Egypt and Tunisia, shut down the sense of inevitability of the Arab Spring. The administration engaged in an illegal war, it lied to the American people and it did so convinced that its unique brand of idealism would transform the region and end the conflict with Islamic terrorists. It ended up doing all the things that it had falsely accused President Bush of doing and its "smart power" left it with a disaster that disproved its theories and made a mockery of its superior intelligence. A big part of Obama's appeal was the conviction on the left that he was so much smarter than Bush; so smart that his "smart power" could never lead America into a quagmire and a disaster abroad. Libya shattered that confidence and "Architects of Disaster" analyzes a story that most Americans have never heard of about a war that they barely remember whose consequences continue to reverberate today. By analyzing what went wrong in Libya, "Architects of Disaster" makes the case for a more pragmatic foreign policy in which we rely more on strategic alliances, even with unpleasant dictators to fight terrorists, rather than on attempts to impose a democracy which is thoroughly alien to the local culture. Hoekstra's experience in Libya leads him to call for viewing countries and societies in local terms rather than global ones and using that local knowledge to pursue our global goals. "Architects of Disaster" is not only a warning for Democrats, but also for Republicans, who might be tempted to sometimes think big where they ought to think small. It's a study in how arrogance leads to disaster and how wishful thinking can make Islamic enemies of the United States seem like friends until the shooting starts.